This freezer meal recipe is near and dear to my heart…and my stomach! I’ve been eating low-carb for the last eighteen months, in an attempt to lose some extra baggage I’ve been carrying around with me. I was doing well until I had surgery in November of last year, and it sorta threw me off my game. Fast forward four months, and I had regained nearly 2/3rds of the weight I had lost. Frustrating and depressing. But entirely my own fault. …I’m now back to watching my carbs, which means that many of my standard freezer meals are out for me. But not this one!!! This one is all mine! Minus the tortillas, of course. I love this one because it has great, bold flavors, without being too spicy. It is easy to prepare, and best of all, it cooks in the oven in just 20 minutes! 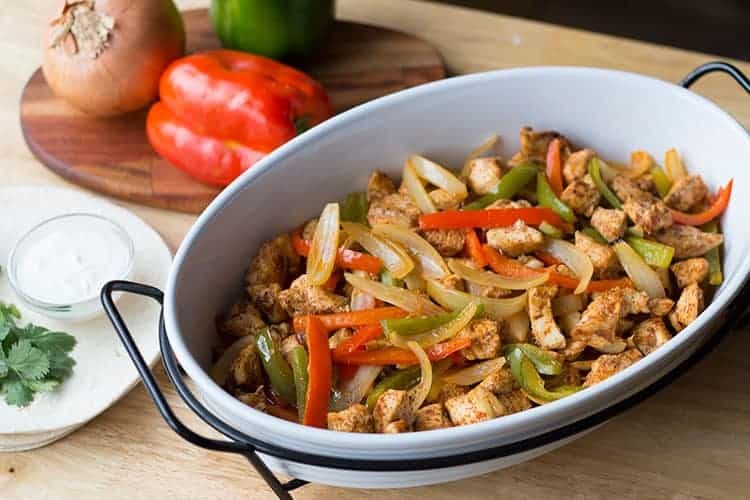 You can dress this fajita mix up or down, however your heart desires. It can be an evening dinner-plate stunner, or a late-night low-key “eating dinner on the couch in front of a good show after a long day” comfort. So versatile! This is also what is often lovingly referred to as a “dump-and-go” meal, meaning you do minimal prep on the ingredients, then dump them all in a freezer bag, and stick it in the freezer. No pre-cooking needed. Then on cooking day, you pull it out, dump it in your baking dish, and bake. Dump and freeze, then dump and bake. Easy peasy. Or skip the freezer part all together and make from fresh – like I said, she’s versatile! Nothing terribly fancy here, just your good, solid, hearty standards – chicken breasts, bell peppers, onion, and some warm spices to give it some zing. 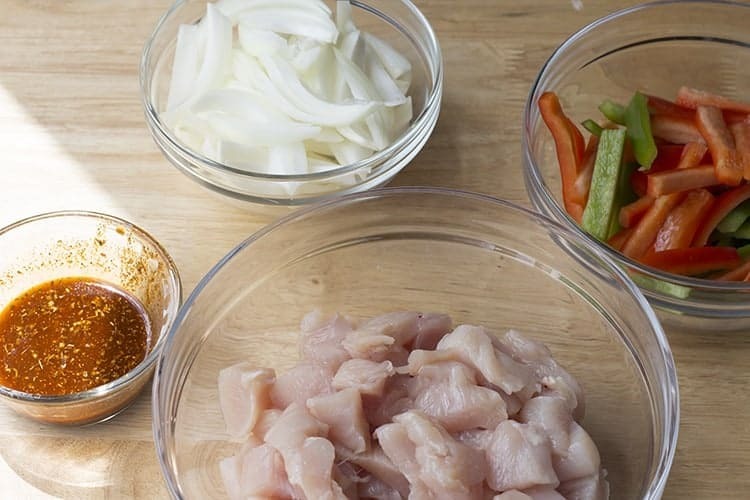 Really, the only prep you need to do on this one is to cut up your chicken, and then slice your onion and bell peppers. I put the ingredients in bowls in order to get a good picture, but when you’re making this at home, just skip that step! No need to dirty any more dishes than you have to. 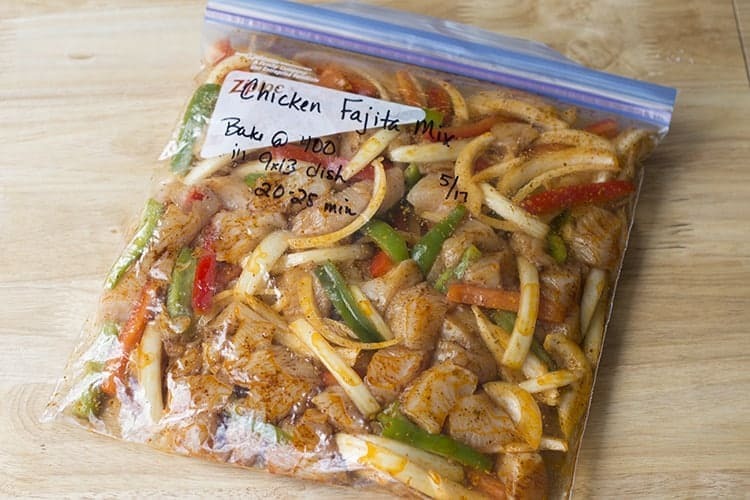 To make this a freezer meal, place your chicken, onions and bell peppers directly into a gallon-size freezer bag. Then add in the oil and spices. Remove as much air as possible, seal it tightly and then knead the ingredients to mix. Make sure to label your bag and include the date and cooking instructions. Then into the freezer we go! If possible, lay your bag out flat as it freezes. This will help save space. Then, once frozen, you can stack it with additional meals, or even turn it upright to stack it like you would a book on a bookshelf. You’ll want to pull this meal out the night before, and let it thaw in the refrigerator. When you’re ready to cook, pour the contents of the bag into a 9×13 baking dish, and bake at 400 degrees Fahrenheit for 20-25 minutes until the chicken is cooked through and the peppers are soft. Serve with warmed tortillas and your choice of toppings, add-ons, or whatever strikes your fancy. Update: I had someone ask me this week if this meal would work in the slow cooker instead of the oven, and I am happy to report that I tried it yesterday in said slow cooker and it worked just fine! (Cook on low for 3-4 hours.) I happen to prefer it done in the oven, because chicken breast sometimes tends to get a little dry in the slow cooker with the long low heat. But it is still totally doable and you might not even notice a difference, especially once it’s inside a nice warm tortilla wrapped up with all your favorite extras! This is an easy freezer meal to keep on-hand for busy evenings when you need to get dinner on the table quick! 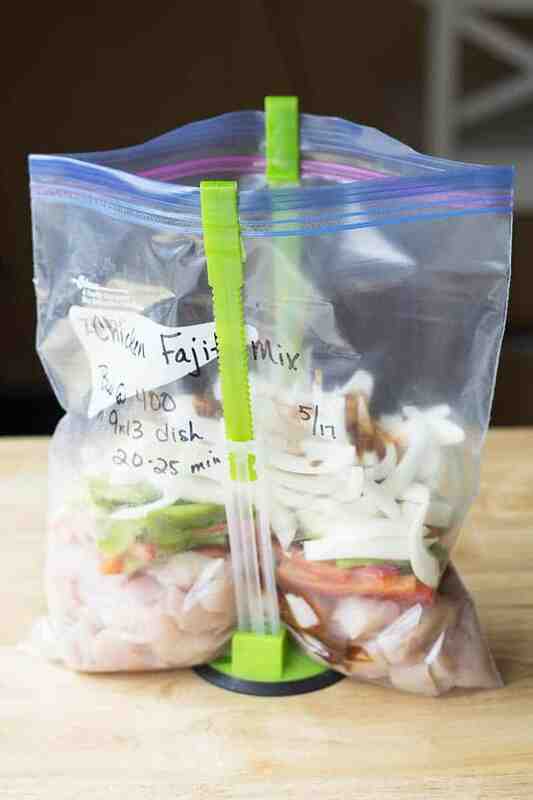 Place chicken, onions and bell peppers into gallon-size freezer bag. Add remaining ingredients to bag. Remove as much air as possible from bag and seal tightly. Knead bag to mix ingredients. Label and then lay flat in freezer to freeze. Remove bag from freezer and that overnight in refrigerator. Pour contents of bag into a 9x13 baking dish. Bake for 20-25 minutes, until chicken is cooked through and peppers are soft. 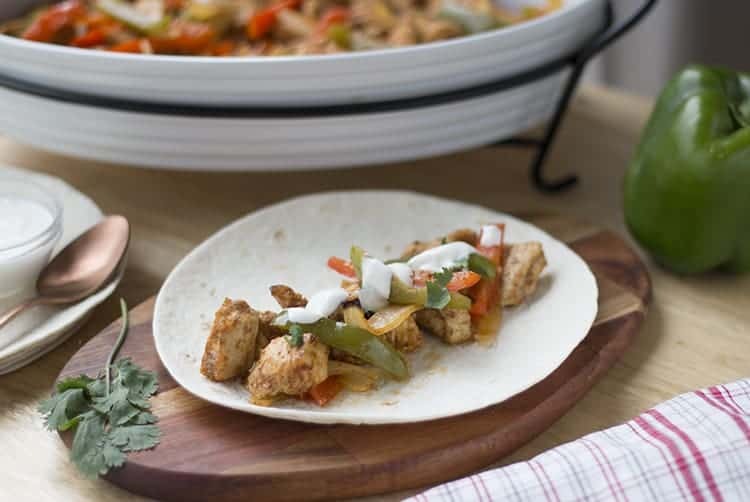 Serve with warm tortillas and your favorite toppings. Instead of baking in oven can you make on stove top? Yes, that can happen sometimes. I generally haven’t noticed it when I have made it, but that might just be me not paying attention or me just being used to the taste of it from frozen. 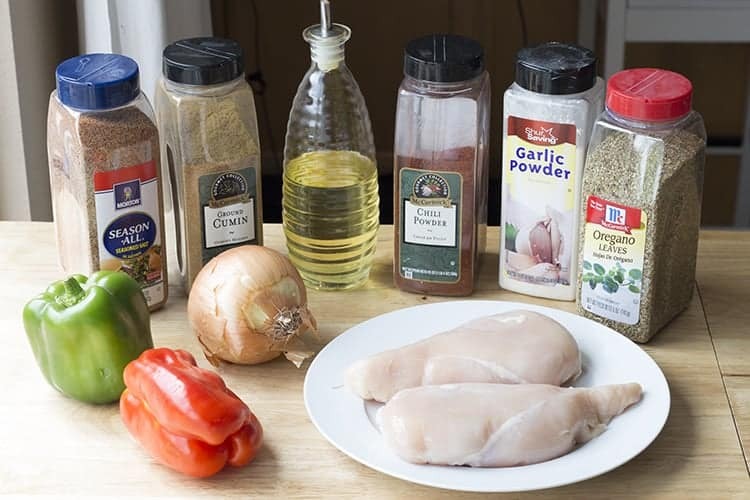 You can try doing 1.5x or even 2x (double) the spice/oil mix with the same amount of chicken and see if that helps when making it as a freezer meal.